The second batch of school supplies distribution was held last Sunday. But this was not yet the end. There are still remaining batch(es). I just thought that the kids should have at least the basic needs for the opening of classes last Monday. 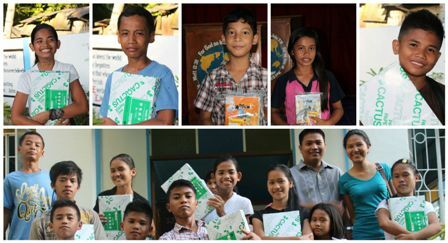 The elementary students received additional 3 notebooks and 1 crayon. The first pack distributed last May 3 included a pad paper, 1 notebook, ball pens/pencils, eraser and sharpener. While each highschooler received 1 ream of bond paper. As I mentioned before, high school students who study at Lourdes National High School Panglao Bohol no longer use notebooks and papers. Instead, they use bond papers to copy the lessons and answer the worksheets. There are still requirements need to be bought and school fees need to be paid. Tomorrow afternoon, I will go to the downtown to purchase the other requirements and school needs of the selected students. The fund raised for the Back-To-School Project was not that big. The project’s money could not supply the needs of all the kids. My prayer is that God will endow me wisdom and discernment to use the money wisely in order to help the kids continue their schooling. The project is still on-going. If you feel God is working in your heart to be part of this project, please don’t hesitate to contact me or leave a comment. Any amount will be a big help. Old but still in good condition bags and shoes and other things which can still be used by the kids are also very much welcome. Updates for this project will now be posted in this site. My other site will be pull down in months so this will be the new home of the Back-To-School Projects.